Detailing the physical features, habits, territorial reach and other identifying qualities of the Arabesque Orbweaver. The small dashes and swirls on the abdomen of the Arabesque Orbweaver gracefully decorate every individual. An arabesque is a graceful position in ballet, but it is also a highly ornate design consisting of curves and swirls that sometimes intersect. Tiles traditionally seen in Moorish buildings and floors showcase these rich, intricate drawings. 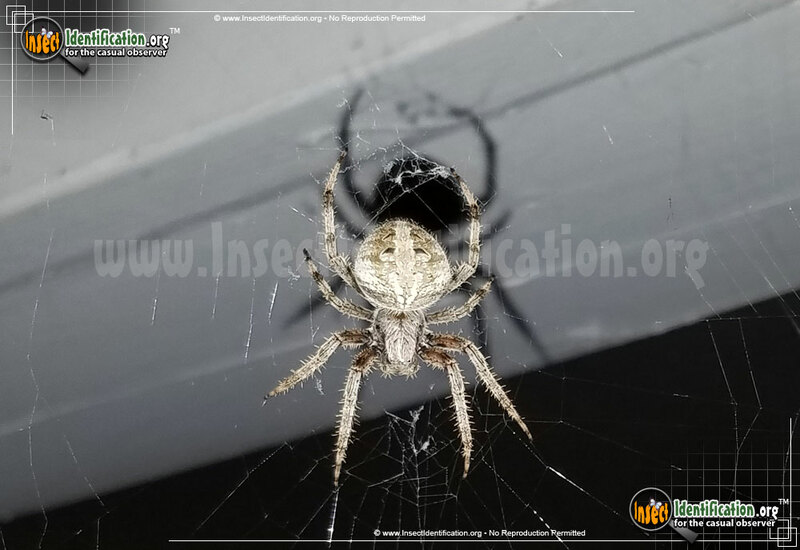 It is this latter definition of the word that helps describe the Arabesque Orbweaver. Highly variable in color, some individuals are brown or almost orange, while others are gray or almost black. Females have wider, rounder abdomens than slender males, but all of them have a myriad of short lines and curvy dashes scrolling down the center of the abdomen. A row of thick, black dashes with a pointed outer corner resemble commas, and these flank both sides of the central decoration, decreasing in size as the commas near the spider's rear. These markings are distinct for this species and helpful identification tools. Like most other Orbweavers, the female Arabesque Orbweaver creates a circular web. The web may be between short bushes, or it may be near a walkway between a tree branch and handrail. Generally, areas with high foot traffic are avoided, but it has happened where webs are built in highly visible places. 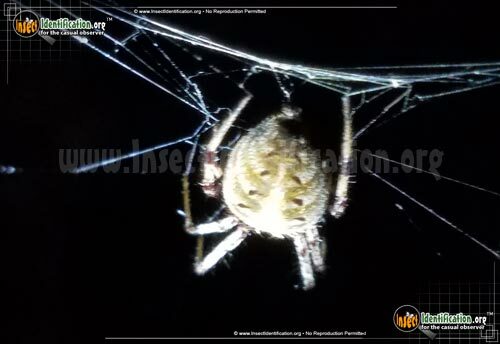 Under cover of night, the female sits in the center of her web, upside down. Sometimes an unsuspecting human walks right through it. Fortunately this tiny spider is not aggressive, and is likely to be just as alarmed as the person who destroyed her meal-catcher. When not tending the web during the day, the female takes shelter and hides under leaves. Usually smaller males hide nearby on a connecting branch or leaf.